I saw an ad in Sky and Space magazine. For sale 21.5” mirror F3.8 or F20, what could this all mean? Well I rang to find out. The primary is 3” thick and, it came with 2 secondary mirrors, One 4.5” Diagonal which would give us F3.8 and one 4” Cassegrain which would give us F20, that’s a focal length of about 11 meter’s. 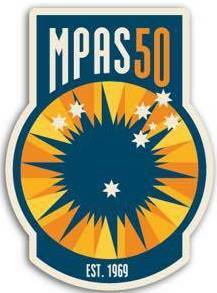 Quick approved from Val and the mirror was in my workshop, were it sat for 5 months while I worked out the design. It must be light, fast to assemble, easy to use and fit through a standard doorway. The primary mirror weighs 40 kg so this meant I would have to reduce the weight every where else, if I had any chance of making it portable. 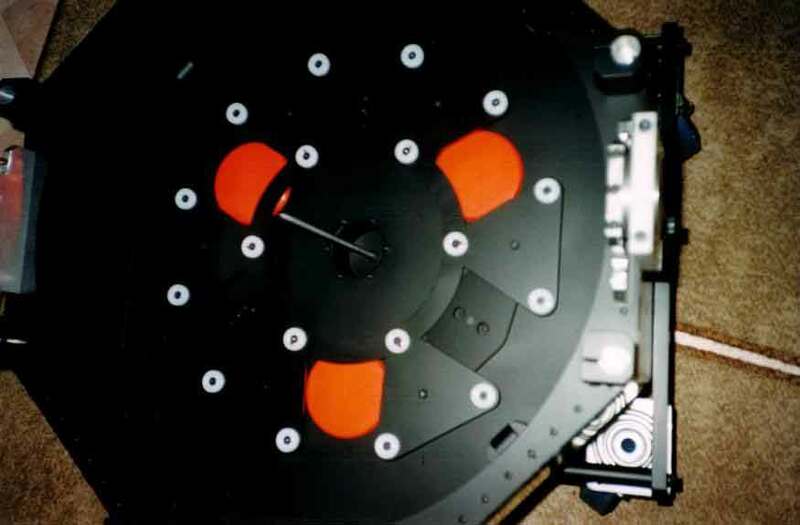 Because of the weight of the primary mirror the bearings will be close to the mirror; this meant a very short Mirror box. 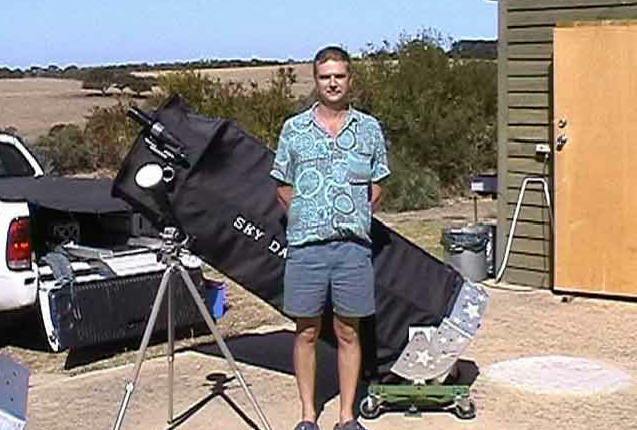 Being such a short F ratio and by keeping the mirror close to the ground, I did not need to use a ladder, I only need 1 step when the telescope is looking strait up. I found some aluminium channel 175mm X 25mm X 3mm thick, this would make the sides of the Mirror box. I decided on an eight-sided Mirror box, this would be compact and strong. I used 1.5mm aluminium sheet for the top and bottom. I made the 18 point floating mirror cell from 6mm Aluminium plate, which I calculated my self because the primary mirror is an odd size. 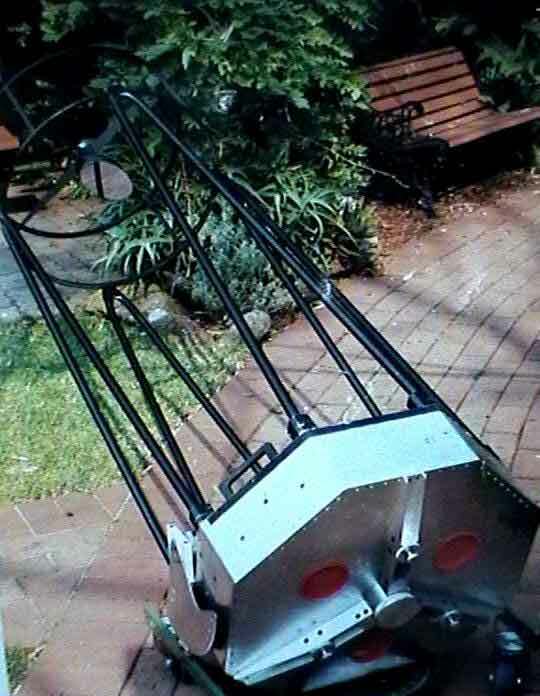 I decided to make the upper cage the same as the first 18” telescope. 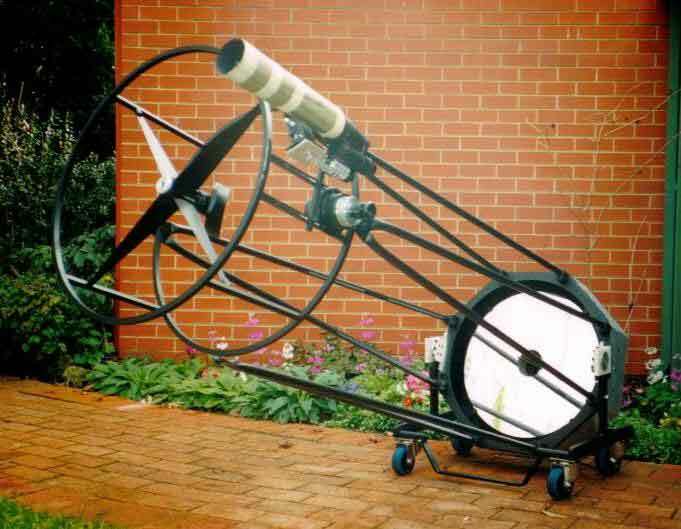 (See building the 18” telescope) which I built from ½” square tube, but I would not line it with aluminium sheet this time. 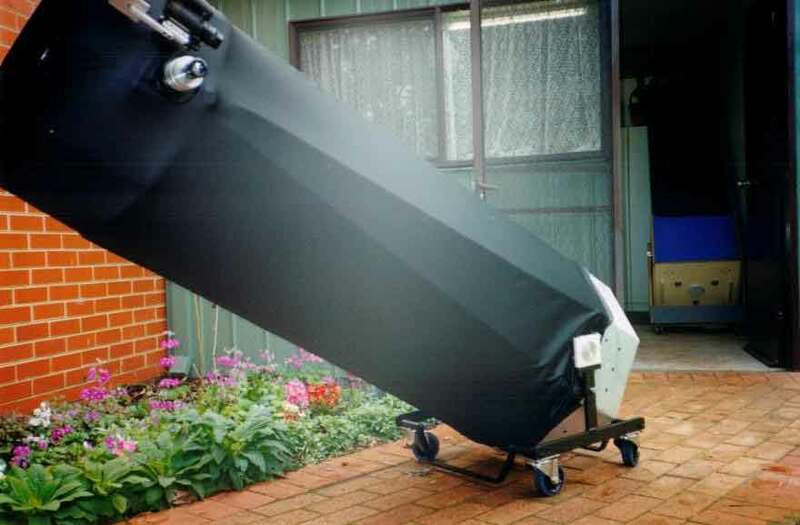 I would just make the material cover long enough to cover the whole telescope. We sewed a stainless steel hoop in to the top end of the cover. The hoop which is 10mm smaller in diameter than the upper cage couldn’t slide down over the upper cage. We used Velcro to attach the cover to the Mirror box. The black material we used is called Ripstop its glossy on one side and flat Velvet on the other; it is almost 100% light block out. I attached the focuser to ½” square tube that had a slot milled in one side, with a sliding nut inside the tube, so we could move the Focuser to line up with the secondary mirror. 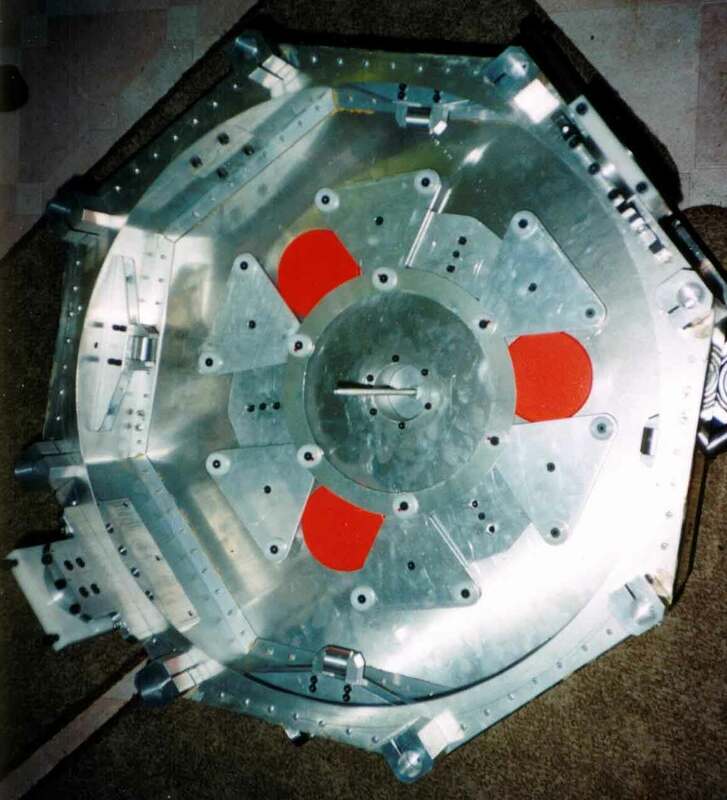 (See Diagram A) The 8 rods are riveted in pairs so they would line up automatically with the screws on the upper cage. (See Diagram E) The 8 aluminium clamp blocks were bored at an angle of 4 degrees to suit the angle of the rods and where made as left and right handed pairs. Building the mount. 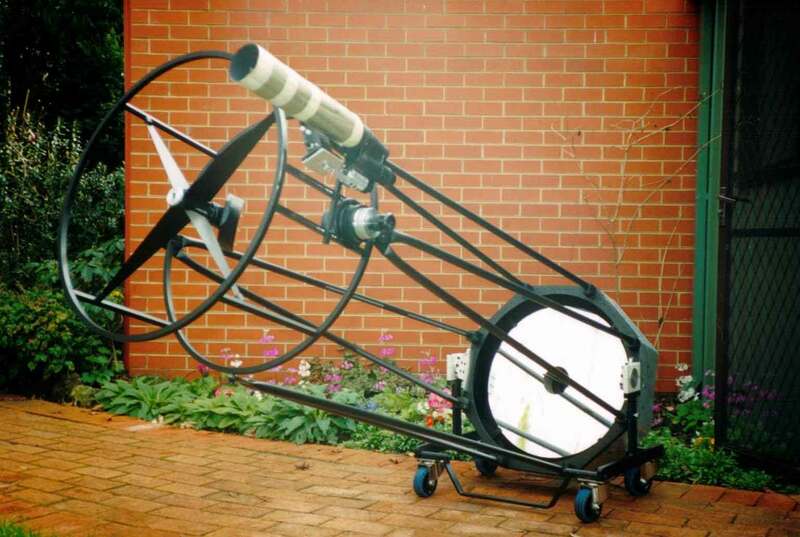 After reading many books on Dobsonian mounts and building one as the book said, I realized that most Dobsonian's were built with little engineering expertise. The books say make it heavy, but the 21.5” mirror was already too heavy, so I had to make it light and strong as possible. I did this by using the least number of parts, and keeping it as close to the ground at possible. The Ground board I replaced with 3 steel bars welded in to the shape of a Mercedes logo. 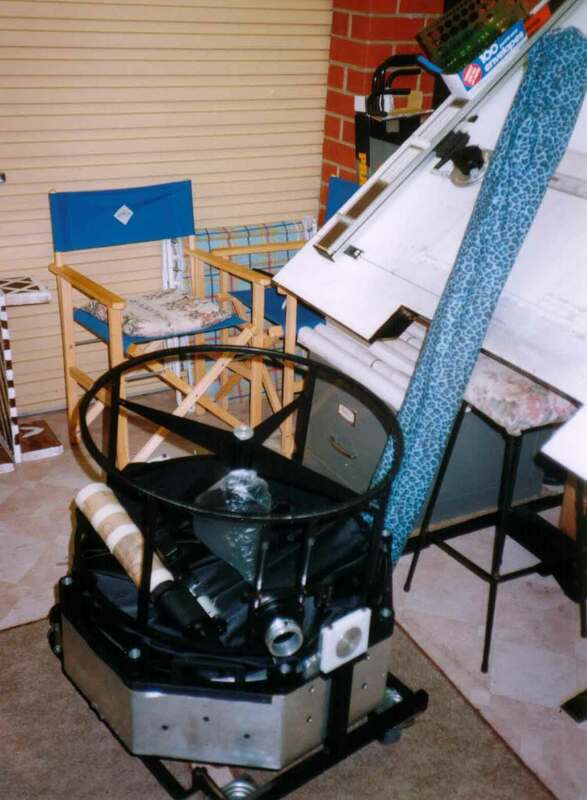 (See Diagram D) The Rocker box I replaced with a steel ring with 2 arms to hold the Mirror box. (See Diagram C) I glued Laminex to the under side of the steel ring as a bearing face. 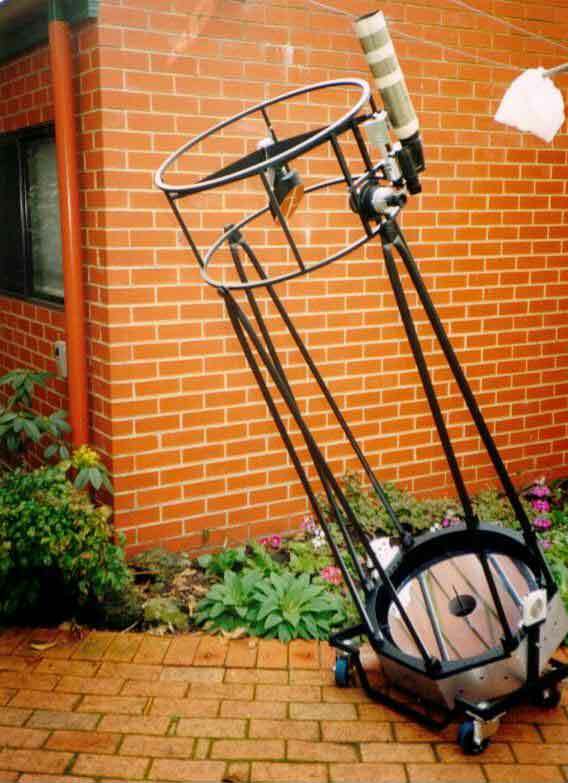 Most Dobsonian's have large inclination bearing to increase friction, but I used small 50mm diameter bearings with tension adjusting screws to increase the friction. Lost in space. I made setting circles from 1.5mm sheet aluminium, the Azimuth circle is marked 360 degrees around the edge and is attached to the shaft which is welded to the Ground frame. 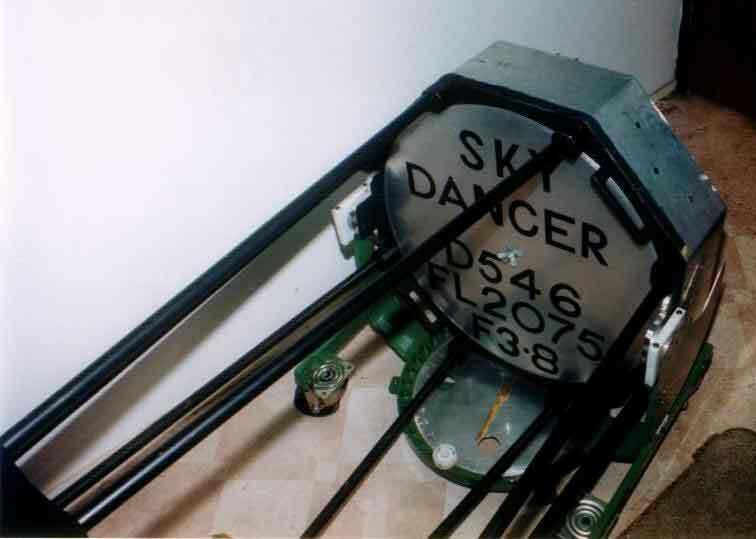 The Altitude circle has 90 degrees marked around its edge and is attached to the side bearings on the Mirror box. I attached a bulls eye level to the Rocker frame. 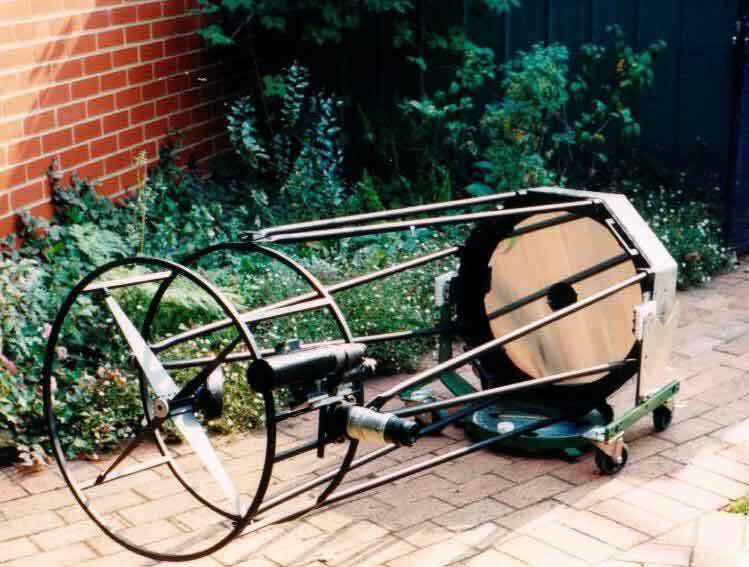 I tapped 3 10mm holes at the ends of Ground frame so the telescope could be jacked up so the wheel would not touch the ground and the telescope could be levelled. What about the view? At first the view was slightly disappointing most eye pieces showed a lot of coma (the stars at the edge of the field were comet shaped) I found that Arthroscopic eyepieces worked the best but had a narrow field of view about 40 degrees. I bought a 22mm Panoptic hoping this might work but it did not, about $500 down the drain. I asked around and was told I needed a coma corrector about $600, so I bought it and it did remove most of the coma, but not all. By experimenting with aperture stops I could eliminate the entire coma. So I found rather than blocking light from the edge of the mirror which would be the loss of too much light. 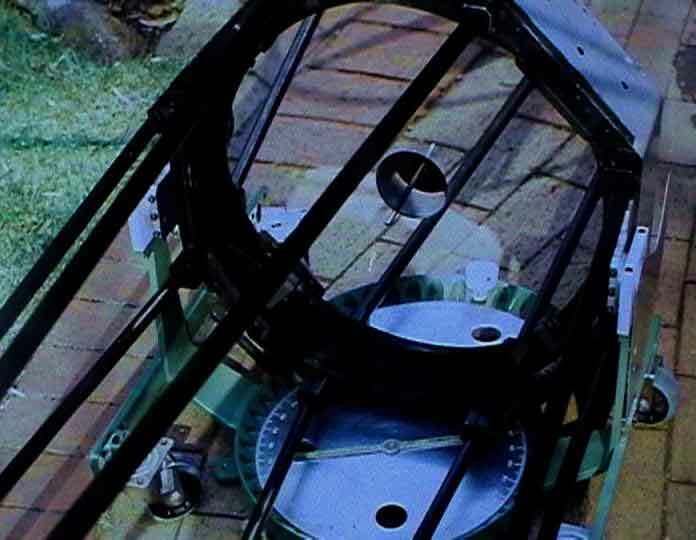 I found by placing a 12” disc over the centre of the mirror had the greater effect, with the least loss of light, which made the telescope equal to an 18” telescope. So most of the time I use the 12” disc. Only when I am tracking down faint galaxies do I remove the disc; most galaxies are fuzzy blobs anyway so no difference is seen. I found high-powered eyepieces worked well without the coma corrector and a 2X Barlow also removed the coma. Also to my surprise an old 50mm camera lens did not suffer any coma at all but was not a wide field of view (See using camera lens as eye pieces) It was only low to medium powered wide field eye piece that suffered coma. After a bit of experimentation the telescope works well. 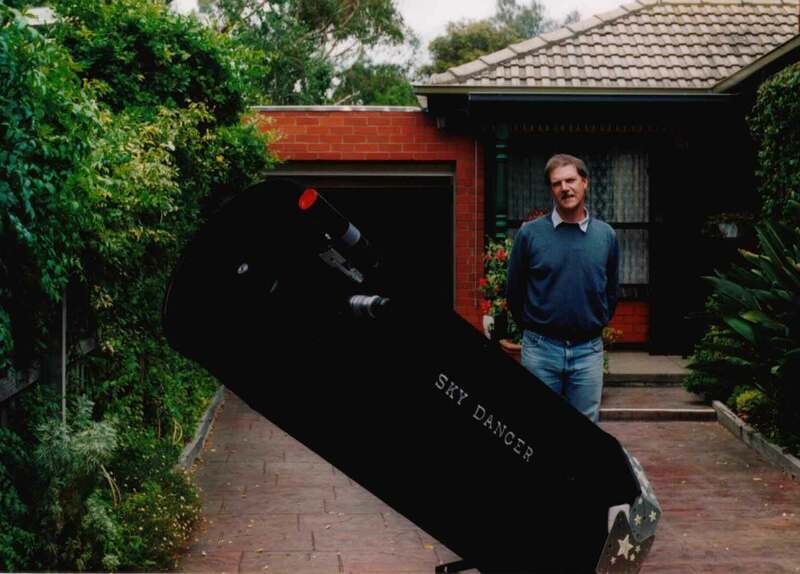 I named the telescope SKY DANCED because sometime it feels like I’m dancing with a fat lady.